We wish you a very happy, healthy, sweet, and prosperous year! May you be inscribed for Life and Good Health. A Healthy and Happy New Year - 5774. We are so grateful for all of the blessings in our lives, which includes the people who live in our Greater Colorado community! May you be inscribed for a year of good health, happiness, and many wonderful blessing. To all our family and friends,we pray for a year of good health and many blessings. L'Shana Tova Tikatevu. May the New Year 5774 be filled with blessings for teshuva and transformation from the Four Corners to the entire world. May you be inscribed for a year of good health and manifold blessings. L'Shana Tova. We are blessed with family, friends, and community and we wish everyone a happy healthy sweet year filled with all good things. Whether you tour our former residence now for sale in Crestmoor or whether you visit us in Baltimore, we welcome you to share in our memories and/or to share in the last furlongs of our horse race (we live near Pimlico). ...and we thank you for our wonderful 33 years in Denver. L'Shana Tova. Shana Tova. The Jewish Experience Family wishes you peace, health and prosperity in the coming year. A sweet and healthy New Year to you and yours. Gmar Chatimah Tova. Shana Tova U'Metukah - A Good and Sweet Year. May you be inscribed and sealed for a good year. Thank you to everyone in our Chavura for making 5773 such a wonderful and blessed year! Sponsored, in part, by Feldman Mortuary. Dr. Neil W. Levin, a professor at the Jewish Theological Seminary and one of the world's leading experts on Jewish music, joins us for our hour-long High Holidays series kickoff. Dr. Levin presents seven classic Rosh Hashana and Yom Kippur songs from the Milken Archive of Jewish Music, where he has served as the artistic director since 1993. These stirring tunes are guaranteed to move and inspire you as we approach the New Year and the Days of Awe. The seven featured melodies are listed and linked below. By clicking on the links you'll be able to hear the unabbreviated versions of each song. This classic tune, conducted in the "Western Sephardic" - or Amsterdam - tradition, dates back to the American colonial era, and would undoubtedly have been heard by George Washington had he ventured into one the five American congregations that existed at the time. The exact same tune can still be heard at Congregation Sheerith Israel (a.k.a. The Spanish and Portuguese Synagogue) in New York, the country's very first synagogue. This recording is sung with a unison choir, as it would have been in the 18th century. Ahot K'tanna is a "piyut," or inserted poem within the liturgy, and is recited at the close of the Jewish calendar year. The text reads: "The year being ended, may all the evils of thereof be terminated..."
This tune is a sophisticated artistic treatment of the shofar service, which is conducted multiple times during the High Holidays. Herman Berlinski's composition gained popularity in the 1960s in Reform congregations in America. It beautifully intertwines the call of the ram's horn with its accompanying liturgy. This holiday tune, composed by Israel Schorr, is sung with a traditional choir in the virtuoso cantorial practice, or Hazzanut. The prayer, which comes from the Yom Kippur service, translates as: "We dare not cast our supplications before You with a false feeling of our own righteousness. We do so because of our faith in Your great mercy." This tune is part of the "Mi Sinai" tradition, which dates back to the Rhineland region of Germany in the Middle Ages. The Mi Sinai tunes are so old, and so well known, that - in the Ashkenazi world - they might as well be considered canon. The Hatzi Kaddish is recited at the start of Mussaf service on Rosh Hashana and Yom Kippur. This tune is a typical cantorial quasi-improvisation (with an improvised choral backup). The composition is attributed to Moshe Koussevitsky, widely-considered to have been one of the greatest cantors of all time. This version was recorded with Ben Zion Miller, a leading modern-day cantor. Une Sane Tokef is a central "piyut" for Rosh Hashana and Yom Kippur, and recites: "We observe the mighty holiness of this day - one of awe and anxiety... We conceive You established on Your throne of mercy... as Judge and Witness, recording our secret thoughts and acts, and setting the seal thereon." Set by Joshua Lind, this tune follows the typical joyous nature of the Asheres S'foseinu prayer, which invokes: "May our entreaties find favor before You, most high and exalted God, Who not only hears but understands, and Who gives consideration to the voice of our shofar blast." Appropriately, this prayer is read following each of the three sets of shofar blasts in the Rosh Hashana Mussaf service. This prayer is read at the end of the Mussaf service on Rosh Hashana and Yom Kippur. This very tuneful setting, again by Joshua Lind, accompanies the following words: "May You strengthen and bless us on this day; may You inscribe us [in the Book of Life] for a happy life..."
Dr. Levin also kindly provided us with tunes for Mi Chamocha, and an alternate setting for the Shofar Service. The Milken Archive of Jewish Music is a cultural and historic project of unprecedented scope, launched in 1990 by philanthropist and business executiveLowell Milken. 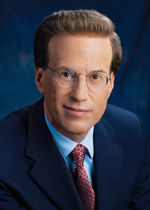 Milken is the chairman and co-founder of the Milken Family Foundation. Dr. Levin has devoted his professional and academic life to the scholarly study of the music of Jewish experience from historical, musicological, ethnological, Judaic, and cross-cultural perspectives. You can read his complete bio here. Hear this special High Holidays program online now. Following Dr. Levin's interview, we air a conversation we had with Chuck Michaels, a Denver attorney, whose ancestors were among the pioneering Jews who lived in Leadville, CO.
Chuck, who - 17 years ago - was at the very first B'nai B'rith Leadville Cemetery Cleanup with his wife Sara and then-infant daughter Shayna (now a senior at Beth Jacob High School), tells us about his ancestor, Solomon Flaks, and gives us a taste of life in late-19th century Leadville. We interviewed Chuck earlier this summer at the B'nai B'rith Leadville Cemetery Cleanup. 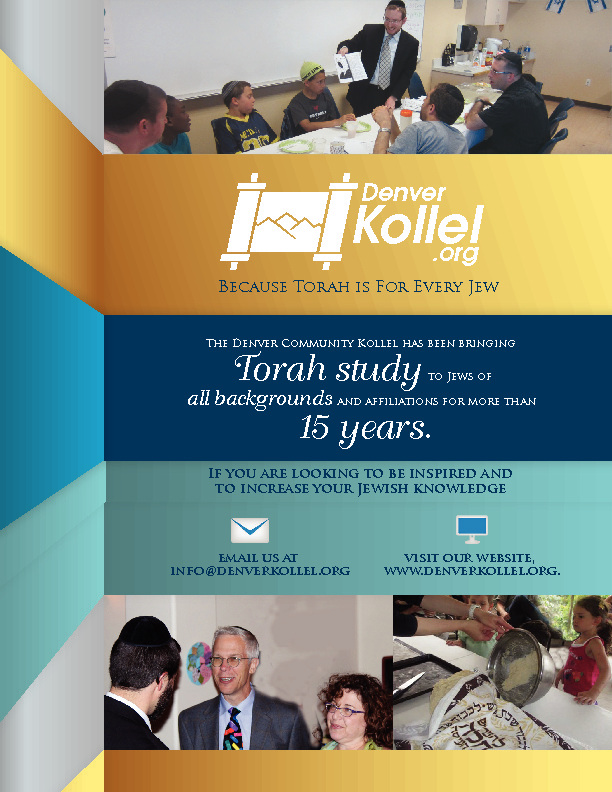 Chuck and Sara's two other children are Shmuel, 15, and Benjamin, 13, both students at the Denver Academy of Torah. Biking for Israeli "Kids Under Fire"
On August 14th, Dr. Herzl Melmed, a 76-year-old Denver gynecologist, completed a 500 mile bike ride from Bandon, OR to San Francisco, CA. Dr. Melmed, who had to compete against hilly terrain, spoke to us from the road the day before his arrival about the trek and the mission of "Biking for Kids Under Fire," the group he helped start which participates in sponsored bike rides to raise funds to purchase bicycles for Israeli schoolchildren living under the constant threat of Gaza rocket fire (bicycling is therapeutic for these children, most of whom suffer from post-traumatic stress disorder). "Biking for Kids Under Fire" falls under the auspices of ActionIsrael. See a video produced about "Biking for Kids Under Fire" below. 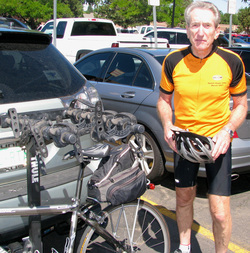 Read a Boulder Jewish News article about "Biking for Kids Under Fire" here. Read an Examiner.com article about "Biking for Kids Under Fire" here. With more than 6,000 members, Temple Emanuel is Colorado's largest shul and the largest congregation between Chicago and Los Angeles. Rabbi Joseph Black, the synagogue's spiritual leader, sat down with our team last week to discuss how he prepares himself and his congregants for the High Holidays. Key in his preparations are a series of reflective questions that he sends out to members of the Temple Emanuel mailing list, either to answer for themselves or to share with those around them as part of a High Holidays discussion. Questions from this year focus on the celebration of Shabbat, support of the Colorado Jewish community, repairing damaged relationships, and taking care of our physical and spiritual health. How often in my daily routine do I take the time to put away my cell phone, computer and other electronic devices and "unplug?" When was the last time that I felt a true Shabbat experience? Have I taken the time to fully appreciate the beauty of God's creation that surrounds me? What are the most important gifts that God has given me? How has my perception of God changed over the years? If I were to be told the exact day of my impending death, what would I do differently today? When was the last time I was able to pray without distraction? Have I been generous enough in my support - financially or otherwise - of the institutions and charities that I find important? Do I feel confident that I will be able to help those who need me in times of trouble? Have I worked to strengthen my congregation? Have I given of my skills and expertise when asked? How often have I been content to complain when I was affected by a problem - but after complaining, not done anything to help solve the problem? Have I allowed petty squabbles and disagreements to distract me from the importance of staying involved in my community? When I am at synagogue, have I done all that I can to make others feel welcomed in the same way that I want to feel welcome? Have I allowed myself to enjoy Shabbat in the context of my community? Have I been able to see the holiness in those closest to me? Are there people I have wronged from whom I need to ask forgiveness? Do I have the strength to take the risk of asking those whom I have wronged for their forgiveness? Have I shut out the pain of others in other parts of the world? In my country? My city? My congregation? My neighborhood? My family? Have I taken time recently to let the most important people in my life know how much I care about them? Have I done all that I could to repair damaged relationships in my life? Have I taken part in any business or personal transactions this past year that were against my religious, moral, or ethical principles? Did I ever ignore the gnawing feeling in my kishkes that told me that I took advantage of someone else? Have I taken care of my body through diet and exercise? Have I prepared medical directives that are clear and unambiguous stating my desires for illness and end-of-life issues? Have I done all that I could to comfort those around me who are affected by illness: have I performed the mitzvah of Bikkur Cholim - visiting the sick? Have I allowed political affiliation to blind me to the real issues revolving around the current debate over the implementation of national health care? How much stress is in my life? Is it affecting the way I live my life? What bad habits have I cultivated that I need to change? Have I been avoiding going to the doctor, dentist or other health care professionals due to financial concerns or fear of what I might discover? In the final part if our three part High Holiday series, we speak with Itamar Marcus, founder and director of Palestinian Media Watch, one of the foremost global authorities on Palestinian ideology and policy. PMW, which has presented its findings before members of the U.S. Congress and members of Parliament in multiple countries, reveals what key Palestinian leaders have to say - in their own words - about Israel and the Jewish people.